Williamette, US Goldings Northern Brewer, Cascade, Amarillo, Centennial, and Summit. 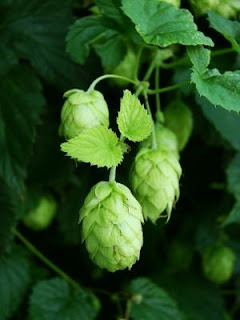 The Single Hop Experiment was so enjoyable to the club that a second round was planned with brewers picking new hops to utilize. As he did before, fellow clubmember Tom H. took notes from the tasting and posted the results on his blog, “And Another Thing…”. Tom H.’s summary notes are reproduced below. It should be noted that the first round had a number of classic American hops, a large number of which were fairly low in alpha acids. This round included some lesser known hops and alpha acids were generally higher than the last round. As before, we decided to taste these in ascending order of alpha acid strength, to reduce any risk of blowing out our taste buds. Here are the tasting notes from the June 2010 RIFT meeting. Very clean, with spice and clove in the nose. It contributed to a "malty nose". This was thought to be good in Belgians and Wits. Notes of clove, anise, licorice, and a minty flavor. Strong complex nose. Metallic, grassiness, lemon citrus, grapefruit. Would be good in a copper ale. This is a brew from the first round, brought back for comparison. Citrus, lemon, dry grapefruit, smooth, piney. Phenolic, cat urine, pine sol. Raw hop, green hop. Smooth bitterness. This was a bit of a surprise, as we did not detect any of the "lemon" character that this hop is supposed to have. It is also a surprise after tasting Brooklyn's Brewery's Saison that features this hop and has a completely different character. This is a hop that needs to be carefully integrated into a brew. Papaya, fruit. Strong nose of grapefruit. Bready, yeasty. Classic American "Big C" hop for bittering. Piney, papaya. Tangy, fruity, smoother than Summit. Similar to Roxy Rolles. Flavors: Candy cigarettes, neutral, clean, malty, earthy. Very tasty. While many of these hops were not the prototypical hops most people brew with, being able to taste and experience each of their flavors was a great learning experience. I'd have to say that I was the most impressed with Chinook (which I wouldn't have expected walking in to the tasting) and plan to use it in the future. Have any other clubs out there tried similar experiments? If so, please post a comment and let us know your club's experience and what, if anything, could be done to improve upon the event. JW - this is great information. As a homebrewer and a hop grower, I've always wanted to do something similar but it's difficult to brew enough batches to have such a wide array of examples. It's nice to do it with a big group. I would be interested in trying some of these beers! Just found this when I searched for single hops beers! Very, very cool experiment. Might offer this up as a fun "competition" with my local club! We also have a bunch of SMASH beers that we'll be sampling soon! Good information, thanks for posting, Dank brewer.